Having fun isn’t hard at Uptown Aces this May With Two Bonuses + $100 Free! 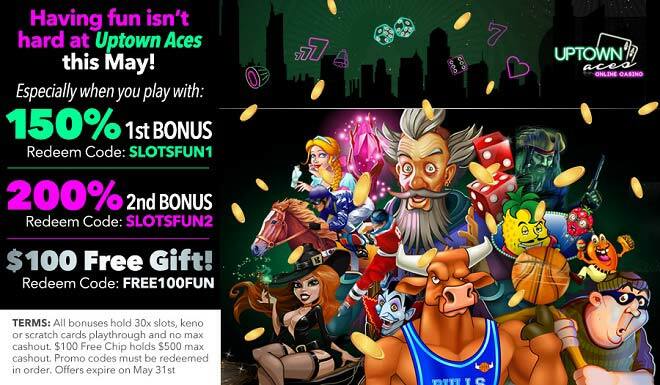 Some people call May one of the most special months of the year – a month when flowers are really blooming, there’s a different kind of excitement in the air and your fun Uptown Aces times are kicked up another notch with two bonuses and a $100 Free Gift! Welcome this exciting new month with tons of winning opportunities and have a blast while collecting your wins with a 150% 1st Bonus, move onto a 200% 2nd Match and top off the fun with a $100 Free Gift! Everyone loves Uptown Aces wins – especially when you combine these with fun times and huge bonuses and free cash!